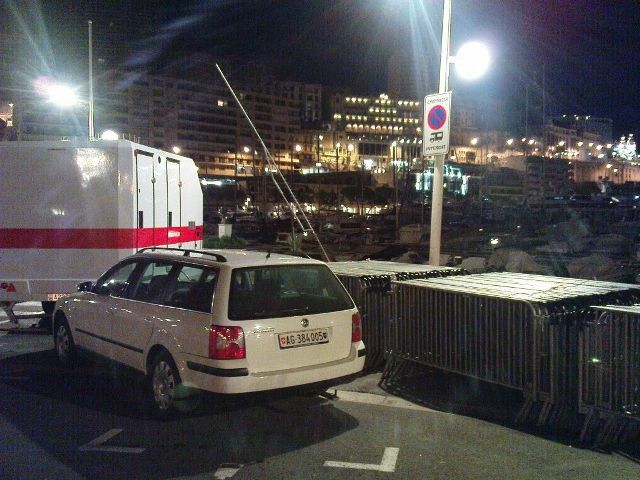 I arrived in Monaco. The weather is beautiful. Its about 17C and blue sky. I went to the harbour to look at which elevation I can operate. I will be QRV as announced in my previous e-mails. Best time is between 0100z and 0200z. The harbour is to crowded before that and elevation is getting to low after that. I could be QRV until 0300z. That is when the moon moves behind a building. I have to shoot right over downtown so the higher my elevation the better because I think noise will go up with lower elevation. Al, I will look for you at 0230z. Please try as early as possible. Hope to work you all. Please look for me. You may also look DL3OCH at skype. Please text only. I will hopefully take some nice pictures. Greetings from Monaco. Here a short report about my activity last night. We had really nice weather over here until late afternoon. It then became very windy and even had storm. Temperature was about 10C without any clouds. Moon was really bright and clear visible. The wind made it very difficult to operate and point the antenna to the moon. I had to hold the antenna the whole time during RX and TX and just went very quick to the laptop between the seconds 48 to 59. Attached you see two pictures of last night. It looks pretty peaceful but pay attention to the flags... I think that gives you an impression of how windy it was. I called once or twice cq and was still playing with the settings when I saw HB9Q calling. He was -22dB here but would have been stronger if the antenna was the whole period pointed to the moon. The QSO was done very quick and I continued calling cq. Then, G4CCH called. I copied him with -25dB. It was still not even 0100z so I called quite a while and I then worked OK1DFC with -22dB. I continued calling cq and received PA3CSG but he had some problems this time. Sorry Geert, I didn't get a confirmation of my OOO. You were up to -22dB almost all the time. I was really happy when I was able to work K2UYH at 0207z with -22dB. Very quick decoding and the QSO was done. Thanks Al. ...it was about time to get you in my 3A log. Already short before the QSO with Al, the wind became stronger and stronger. Its not that the wind came only from one direction, it changed all the time. I almost lost my mast and the antenna has hit the car but nothing bad is happened. I then decided to take everything down. 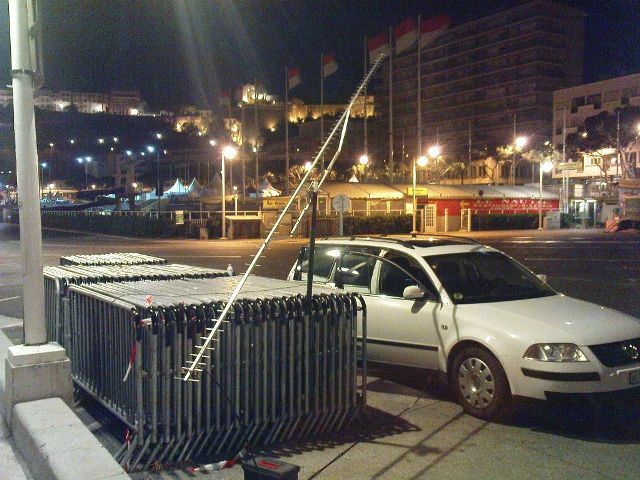 The police showed up at about 0130z but they were happy when they saw my licence and the document from the telecommunication authorities of Monaco. Weather today is really very nice. Blue sky, 17C and sunny. Its time to take a rest and get a cappuccino at the harbour area. I could be on tonight again if someone else wants to try. I would be QRV from 0030z until 0100z (with open end). Please let me know if you would like to try again. I just want to go a little earlier to bed then last night.